There are two main types of head halters available for dogs. One is the Halti, one is the Gentle Leader. Of the two, the Gentle Leader is better, in both design and control. A much simpler design, the GL sits behind the dog's ears and around the muzzle, two nylon straps, connected underneath the chin. This is NOT a muzzle. The GL controls the dog by effectively controlling his nose. Where the nose goes, the dog is sure to follow. In a close second comes the Halti. While made along the same basic principles as the Gentle Leader, the Halti has a much more complicated design that interferes with it's effectiveness. Also known to cause spinal and neck injuries in a struggling dog. Also known as the "power steering for dogs" collar, the prong collar is extremely effective for large, thick-necked dogs, but not for the dog who is an arm yanker. Looking like some medieval torture device, the prong collar's method of operation is to pinch the dog's neck with the prongs, effectively distributing an even mild pressure that does no injury. The pressure is very mild, and does not hurt, merely hinders. You can try it by putting it around the fleshy part of your thigh and pulling. You'll notice the difference immediately compared to the pain and choking sensation ofthe choke chain. NOT recommended for dogs who pull on the leash steadily, this is merely a correction tool, and not a constant collar. It must be fitted properly, and you must know how to properly use it. Like any tool, it can do harm if used incorrectly. I do not recommend this collar for new dog owners unless extensive studying is done on it's use and a veterinarian consulted for fitting. Not for the novice, and not recommended at all, the choke chain comes in dead last in this collar comparison. 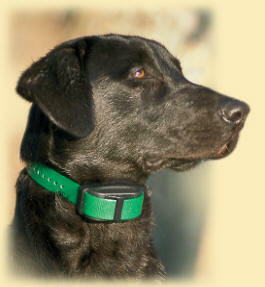 Studies have shown extensive trachea and neck injuries from improper use of this collar. It does exactly what it's name implies, it chokes, and if your dog is a puller, it chokes continuously. If used at all, it must be used by an experienced trainer. Please remember to acclimatize your dog to any new collar, and ensure your dog associates it with good things. Plenty of treats and petting will help immensely. How to Teach Your Dog to "Sit"